Discovery update! Yesterday, as we studied the large flock of blue flamingoes in the Galapagos Islands in their natural habitat, a group of about twenty male birds began to do a mating dance. The show was quite entertaining and a couple of us were found to be laughing as the flock gathered together compactly, moving their heads in a jerkily manner. It was an amazing experience and the female birds quite liked it! We will keep you posted. Congratulations to Flint and Bertha, the soon-to-be parents of a baby flamingo! After the birth, we will send the family back to the Galapagos Islands where they can adjust their life and begin to live with the rest of their species. Noah, our other flamingo, seems to really enjoy life in the zoo, and will be staying with us to welcome any other flamingoes that happen to come here in the future. Exciting news! We have just discovered an area in the Galapagos Islands where over fifty flamingoes live! 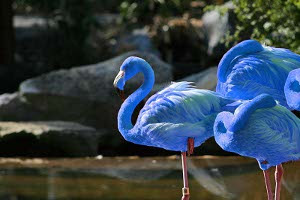 We are staying here for a few weeks to observe the actions of the Blue Flamingoes in large groups. Soon, we'll let you know about everything we've learned about. We are very sad to report that Stan has passed away. We had been monitoring our flamingoes after their release, and we noticed very unusual behaviour coming from her. We decided to fly to the island and check in with her, but by the time we reached the location, she died. Though we will never be able to determine her exact age, we believe that Stan was one of the oldest of the flamingoes that we had captured at the beginning of the year. We have just released Lila, Stan, Goofy, Trevor, Louie, Pecker, and Marty. We already miss them! Flint, Bertha, and Noah will stay with us for further research. We will keep you updated. The seven flamingos we have caught are with us now in the zoo. They will be released on August 19, 2012. We have named all seven of the birds, and we can now call them by their names. The names are Lila, Stan, Goofy, Trevor, Louie, Pecker, and Marty. Louie and Lila are proud to announce the birth of their first chick, Flint, a fuzzy little show-off. As well as that, Trevor and Stan are now the parents of two flamingo chicks, Bertha and Noah. We are now almost a big family, and we are sure that some of us will feel very emotional when we must set the birds free.